Hello! My name is Andrea. I am the new Communications Coordinator with the TK team! As an Albertan transplant, I am on a mission to experience as many local products and attractions that Kamloops has to offer and along the way share a unique perspective with you all! On Thursday, I spent the afternoon with Terri from Divine Wine Tours exploring BCs’ newest wine region otherwise known as the Kamloops Wine Trail. Terri picked us up in her beautiful vehicle which had a few hidden treats for those who would play adult bingo. Our first stop on the trail was Woodward farms and Privato Vineyard & Winery. I thoroughly enjoyed the French architecture feel as we entered the tasting room, notes of oak and sounds of Christmas greeted me. We sampled a few delicious wines, my favorite being Privatos’s award winning Rose wine. After sampling I took a peak at the most beautifully groomed Christmas tree selection I had ever seen! John Woodward’s expertise in forestry really shines through. I suspect it’s one of the few places in BC you can purchase wine and Christmas trees! 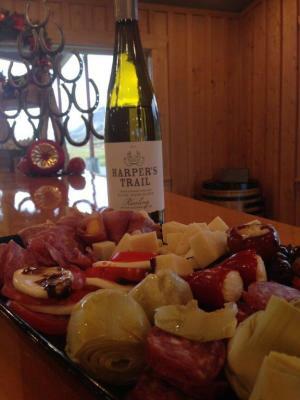 Next stop on the tour was Harper’s Trail Winery. 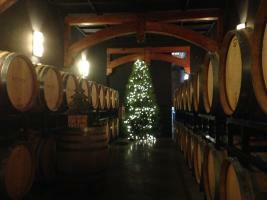 Kamloops’s flagship Winery has a cozy western feel as you enter the tasting room. Terri had prepared an amazing snack platter of olives, cheeses, crackers, and delicious meat. Vicki Collet, co-owner of Harper’s Trail graciously showed us around the temperature controlled room which has a variety of French and US oak barrels. What is new on the horizon for Harper’s is a batch of bubbly...stay tuned. Within the tasting room you can purchase a variety of local product including delicious wine jam, the perfect complement to any meal. Last stop for the day was Monte Creek Ranch Winery. Kamloops&apos;s newest winery. Situated at the far east end of Kamloops lies the uniquely designed stone building home to a variety of unique products such as Monte Creek’s very own honey and opportunities to purchase local jam and cook books. We were offered a tour to see the Barrel room and to check out the local artist who has been in house all summer long creating beautiful paintings from different aspects of the vineyard. He was getting his collection ready to showcase at Monte Creek’s open house the following day.